The U.S. House of Representatives has just posted on the Internet its health care overhaul bill, HR 3962, “To provide affordable, quality health care for all Americans and reduce the growth in health care spending, etc.” All 1990 impenetrable pages of it. How huge is this collection of mandates, subsidies, tax hikes, spending and perverse incentives? As the picture shows, it's a monster. This bill isn’t just longer than a Stephen King novel, it’s also scarier, because aside from the title, this tome is all nonfiction. 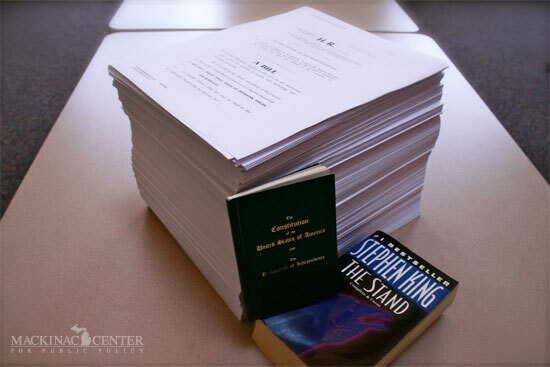 Congress could benefit from a good editor, though, because in 800 fewer pages, Stephen King wiped out 99 percent of Earth’s population, rebuilt society, created a dramatic good vs. evil confrontation and nuked Las Vegas. HR 3962 only manages to give the government control of 17 percent of the U.S. economy and the health care choices of every American. Oh, and what about the other book in the image, the little one? Pay no attention to that old thing — Congress isn’t.